The history of tattoo guns began quite a long time ago. Let’s glance back at 1800s. In the beginning of the nineteenth century Alessandro Volta (intelligent chemist and physicist from Italy) invented very useful and common nowadays thing – electric battery. After all, the prototypes of first tattoo machines worked with batteries. Later in 1819 famous innovator from Denmark, Hans Christian Oersted, discovered the electrical principle of magnetism, which was applied for tattoo machines as well. Many years later, in 1891 American tattooist Samuel O’Reilly patented his first electric tattoo machine. Of course, the puncturing tools were used even before, however, it was not full-fledge device for tattoos. The bright example of such machines is the device created by Thomas Alva Edison. In 1876 he patented a rotary type device. The main purpose was to simlify everyday routine in the office. Battery powered, this machine made the stencils for flyers, papers or similar things. It became much easier to punch the hole in the papers; additionally, with the helpful hand of ink roller, the machine copied various documents. Even in the twenty first century we use the same way of stencil transfer. Companies, dealing with sign painting apply the similar method in their industry. Thomas Alva Edison – talented and prolific American inventor – was born in 1847. During his 84 years of life he patented more than one thousand inventions: phonograph, the light bulb, mimeograph and telegraph system. In 1877 he renewed a stencil pen plan; in the old version Thomas Edison did not fully realize his idea, so he got one more patent for improved version. New machine had a couple of electromagnetic coils. These coils were located transversely to the tubes. The reciprocating movement was made with a flexible reed, which vibrated over the coils. This reed created the stencil. 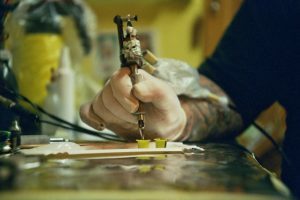 One tattoo artist from New York decided to apply this technique in tattooing. It took Samuel O’Reilly fifteen years to modify the Edison’s design. Finally, the result was incredible – he upgraded tube assembly, ink reservoir and overall adjust machine for tattooing process. The long years of work were remunerated – Samuel O’Reilly patented his creation and became number one US tattoo machine inventor. This event was the official beginning of the tattoo machine development. His design is still the most valuable and common among tattoo artists. This patent was only the starting point for the long way of changes. The new version of tattoo machine was patented in 1904 in New York as well. Charlie Wagner noticed that his main inspiration was Thomas Edison. But historians say that Samuel O’Reilly machine was the main stimulus for new invention. Actually, it makes no sence to argue, because you could find the influence of Edison design in both Wagner’s and O’Reilly’s job. The reason for such imitation and redesigning among inventors is that they all located on the east side of the United States. Moreover, Edison organized workshops in New York in order to demonstrate his accomplishments to the people, travelling from his home state New Jersey. It does not matter was it O’Reilly or Wagner, or any other creator – the modified machine from 1877 performed very well in terms of tattooing. Enhanced ink chamber, stroke adjustment, tube assembly, other small details played a great role in the further story of tattooing machines. Percy Waters registered the patent in 1929. It had some differences from previous versions of tattoo guns – two coils had the same electromagnetic type but they got the installed framework. There were also a spark shield, switch and a needle added. A lot of tattooists believe that exactly Waters’ idea is the starting point of the tattooing machines. The background of such belief is that Percy Waters produced and afterwards traded various machine types. He was the only person who actually sold his patented machines to the market. The real pioneer developer of the style was another person. Unfortunately, the creator’s name was lost. The only things Waters did – he patented the invention and offered for sale. The year of 1979 brought new innovations. Fifty years later, Carol Nightingale registered renewed tattoo machine guns. His style was more sophisticated and elaborated. He added also possibility to adjust the coils and back spring mount, added leaf springs of various length, other necessary parts. As we can see from the past of machines, each artist personalized his tool in accordance with his own need. Even contemporary tattoo machines, passed centuries of modifications are not perfect. Regardless the fact, that all tattoo devices are unique and adapted to personal needs, there is still Thomas Edison’s conception in the heart of all tattoo machines. With various and supplementary elements, the base of all is the same. Many inventors from United States and European countries continue upgrading old machines’ versions. But only several of them are able either to create a really unique design with more helpful details and get a patent, or invest enough money and time in realization of their ideas. In terms of process, to find a better design means to pass the hard way full of trials and errors. There is no specific way for improvement. Theoretically, new versions of tattoo machines should mean better performance and functioning. But in reality these changes often bring no improvements or make the machine even worse, which stimulate developers to rethink their ideas, finding new ways again and again.